These guys must play hockey, 'cause that's some hat trick! Leave your caption in the comments and we'll see you Sunday when we'll um, er, unveil the winner. Oh, hey, and a shout out today to my fellow Wednesday caption contest companion MadMadMargo. Margo's a big fan of my music blog, dufusdownbeat, and leaves me comments almost on a daily basis. We have a great time discussing rock and roll there. Well over at her place on Monday, Margo wrote a really nice piece about the blog and bumped up my followers and commenters. Thanks Margo and thanks to all those that dropped by. It's only rock and roll...but I'm glad you like it. We always lift our hats to the ladies. The 'Mr. Walmart' competition gets racy. Doesn't this plaid make me look kinda puffy? You can't judge a man's size by his cover. Our hat's are off to you. No wait...! How about a smile instead? 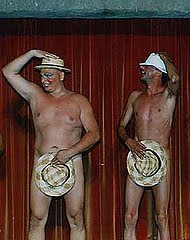 Just as the Johnson brothers were about to finish their rendition of the striptease from The Full Monty, the crowd begged "Please Leave Your Hats On!". First two drop outs of the Tareq and Michaele Salahi Gate crashers seminar. In an ill-advised salute to Alabama's national championship win, two intoxicated fans "Bear" it all! Since When Is Basketball Played With Guns?